Even though Tawn and I had a chance to visit with them in Los Angeles just a few weeks ago, it was a pleasant coincidence that Gary and William had scheduled a trip to Bangkok for the end of June. 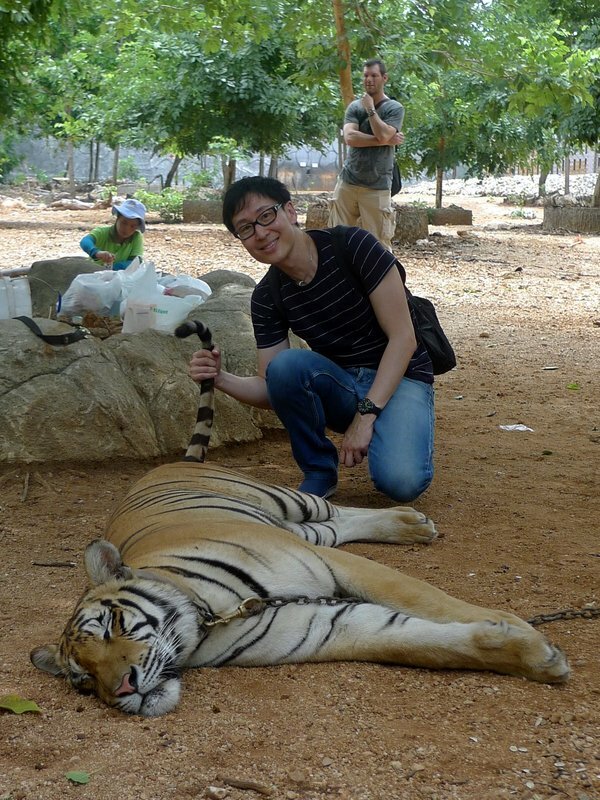 We were able to see them several times during their visit, and they invited me to travel to Kanchanaburi Province with them to visit the Tiger Temple. 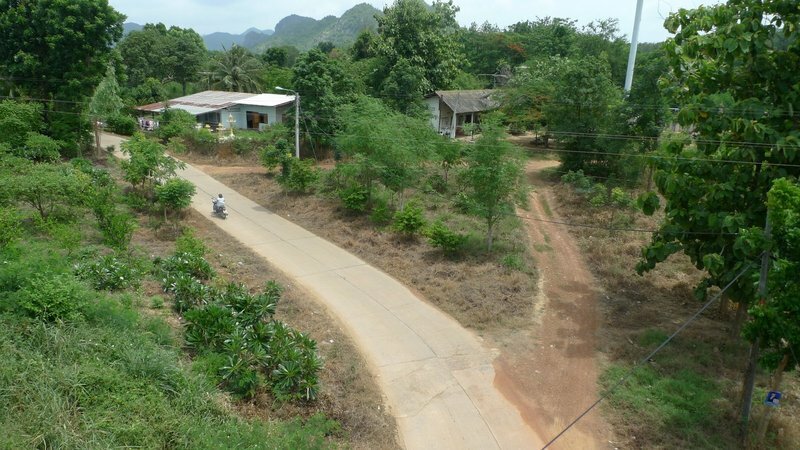 First stop was the town of Kanchanaburi itself, about two hours northwest of Bangkok. This town, located on Maenam Kwai (“River Kwai” – pronounced “kwae”), is the site of the bridge made famous in the 1957 David Lean film, Bridge Over the River Kwai. We made a quick stop at the very good Thai-Burma Railway Centre, the better of two museums in the city about the building of the bridge. Next, after a delay of about 45 minutes, we jumped on a train pulled by a 40+ year old GE diesel engine for a trip across the bridge and about an hour towards the Burmese border. 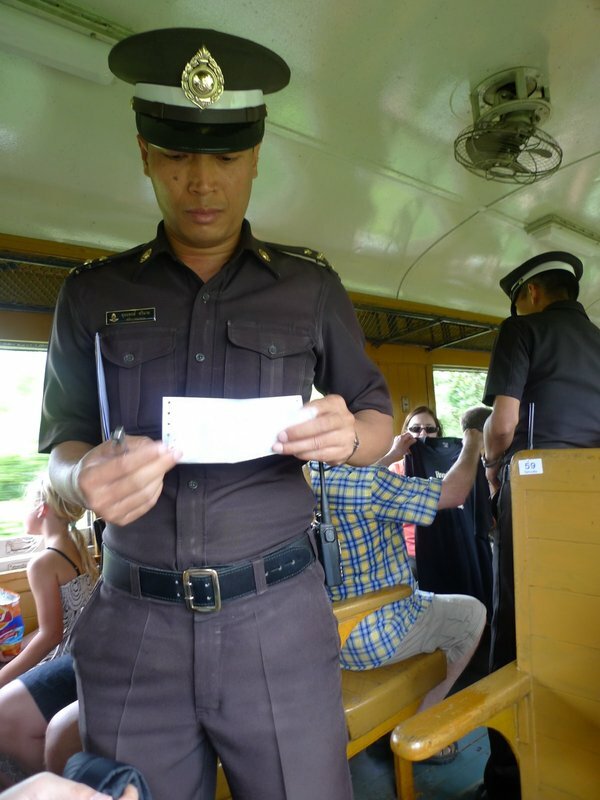 Riding in a nearly antique (but still considered standard, third-class quality by the State Railways of Thailand) car, our interest quickly faded as the passing scenery blurred into a hazy green. 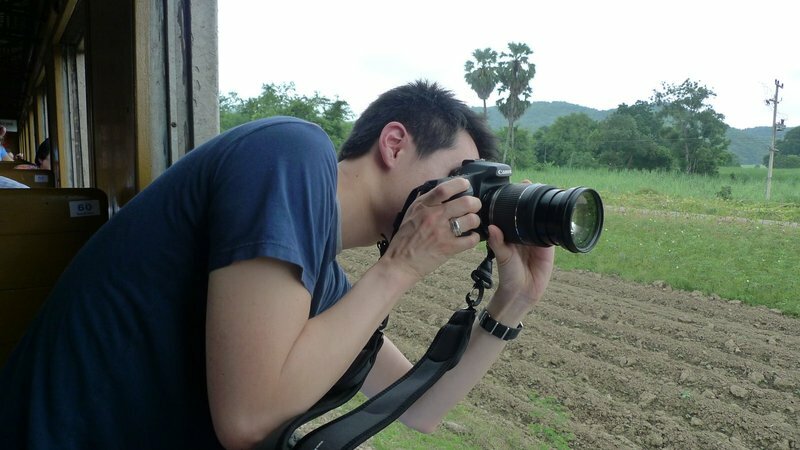 William, leaning out the window, takes a few shots of the countryside. Fear not, we were actually stopped at a small country station when he did this. Otherwise, he would have been whacked in the back of his head by overgrown bushes alongside the tracks. A lone motorcyclist travels a country road as we pass a pair of houses. 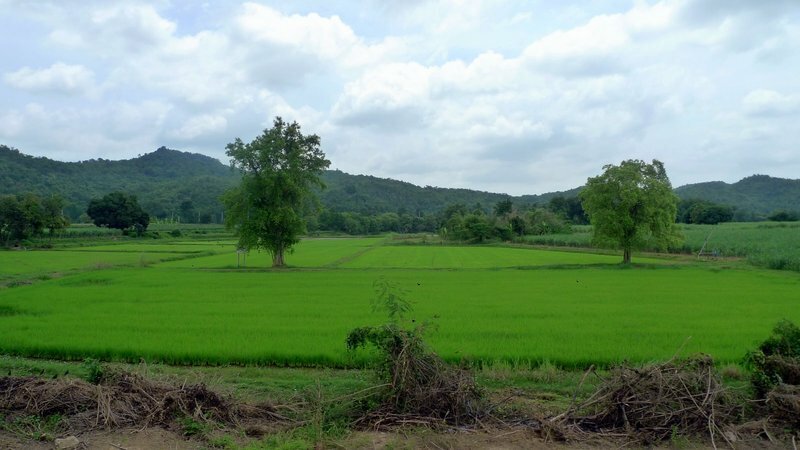 Young rice grows a vibrant green in rich, volcanic soil. Can you identify these crops? 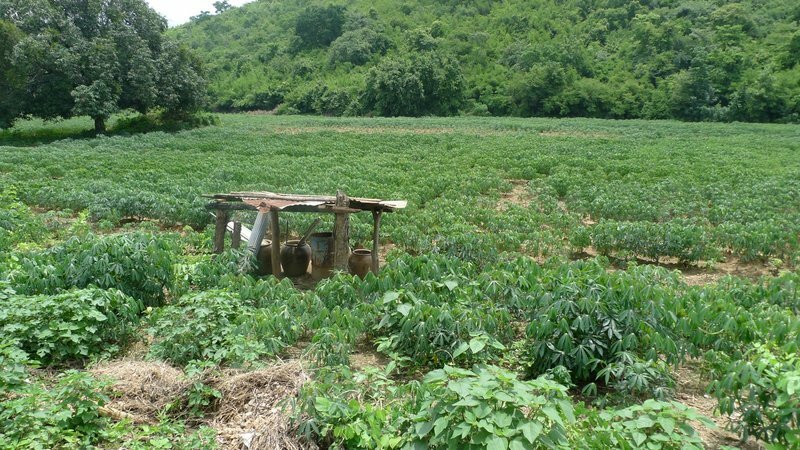 Our tour guide disappeared for most of the train ride, but I was eventually able to learn that these are cassava plants, from which tapioca starch is obtained. After much too long on the train, we disembarked at a dusty whistle stop and boarded our van, which had been chasing after us. About twenty minutes later we arrived at the Tiger Temple. The temple itself started out as a forest monastery in the mid-1990s. Over time, the monks came to care for insured birds, an injured boar, and other animals they either encountered or were given to them. The large grounds of the monastery developed into something of a wildlife sanctuary. 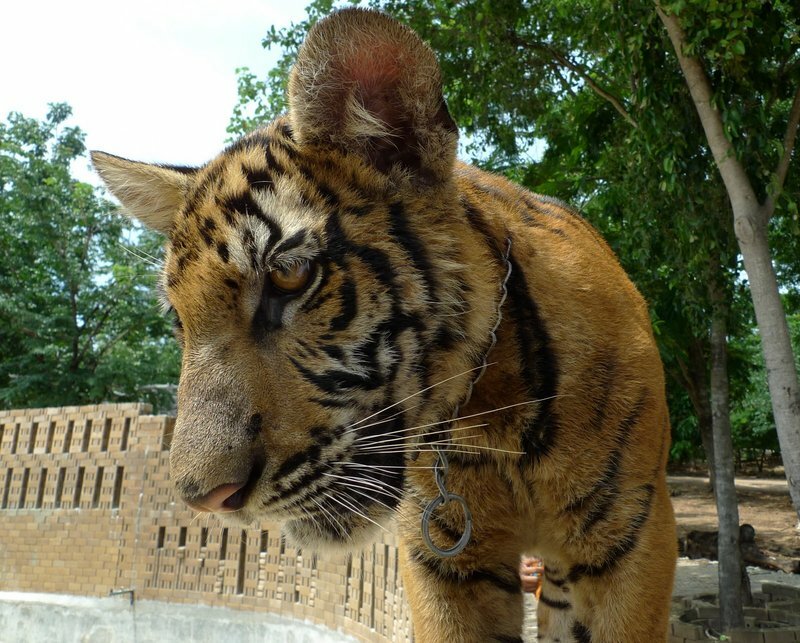 In February 1999, the first tiger cub was brought to the temple. The cub had been orphaned by poachers and then had been sold to someone who was going to have it stuffed. The cub survived the botched procedure to euthanize it and was brought to the temple. Over the next few years, other orphaned cubs were brought to the temple and the head monk cared for them in following the principles of compassion for all living beings. My last visit there was five years ago and the temple has developed quite a bit. It remains a very popular tourist destination and the visitors’ fees go to support projects to protect the tigers. The temple has also come in for some criticism from animal rights activists, which I won’t go into here other than to say that I did not witness any signs of ill treatment of the animals. 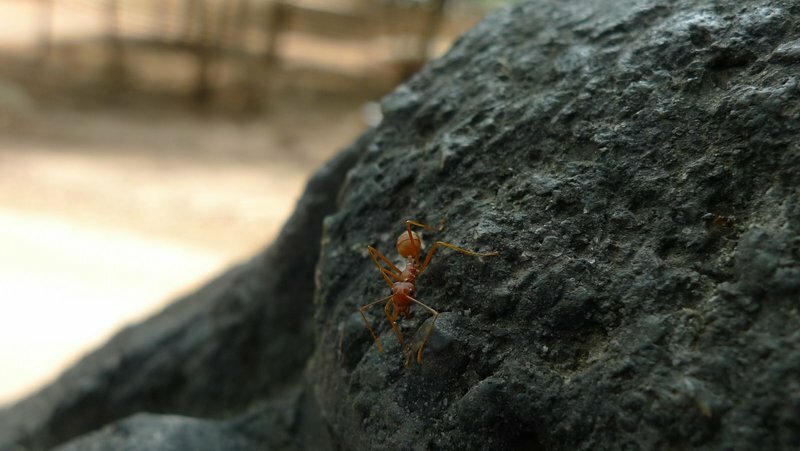 Okay, not a tiger, but a very large fire ant. I was impressed with the macro focus on my camera! The tigers, much like all cats, were napping in the warm afternoon. There were about three or four staff members and volunteers for each cat and we were instructed about how to approach the cats and then the staff would take pictures. 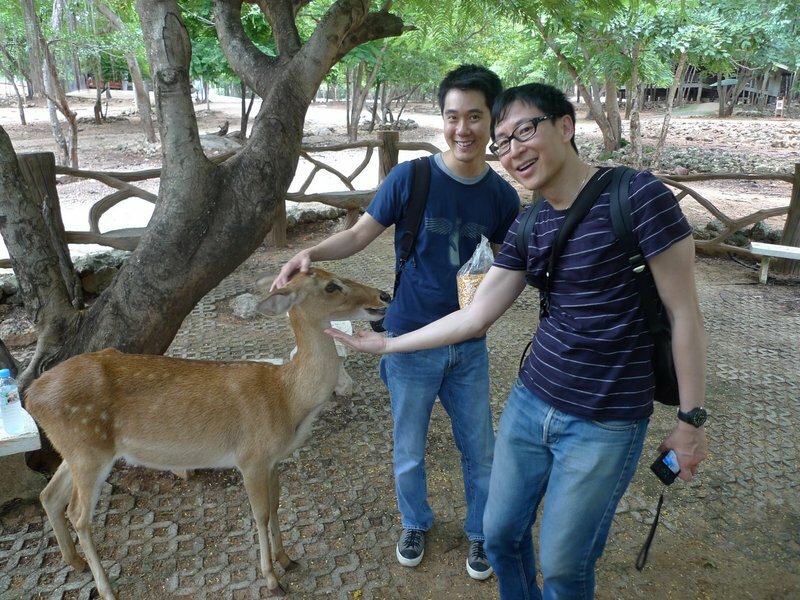 There were also plenty of other animals roaming about the large temple grounds, including this very friendly deer named Ta Waan – Sweet Eyes – who knows our tour guide because he always brings a bag of dried corn with him to the temple. After feeding her, Ta Waan became our new best friend, following us around the temple. 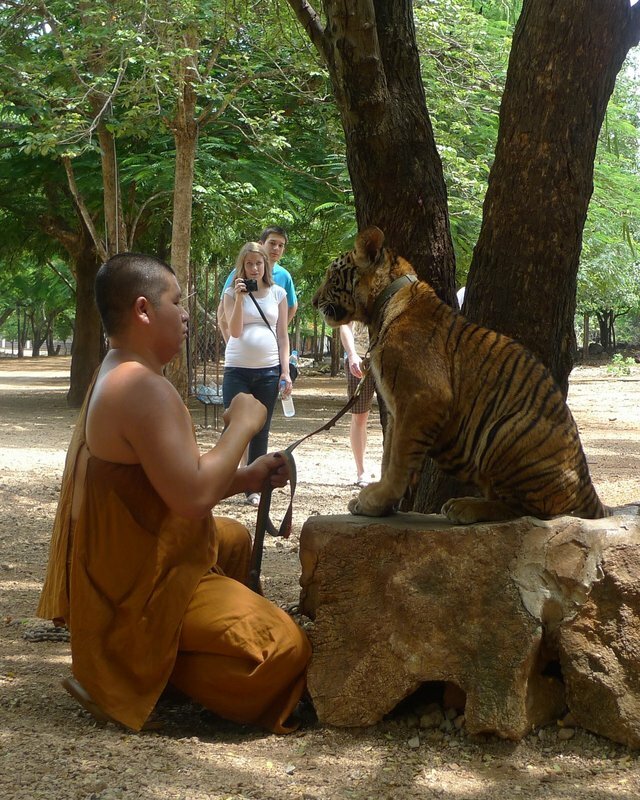 Many of the tiger cubs are handled by various monks. They play with them and keep them out of trouble. This one made a lunge for Ta Waan, who bounded away, and the monk literally had to grab the tiger by the tail to keep him from running after the deer. Since my last visit, the temple has introduced several programs that allow more interactivity with the cats, all for an extra price. One of the programs was being able to feed and play with the cubs. Gary and William opted for this and ended up with some wonderful pictures and great memories. You’ll have to stay tuned to Gary’s site for those pictures. Another program was being able to exercise the big cats. Visitors are escorted by staff members into the exercise enclosure (Daniel in the lion’s den?) and get to play with them much in the same way you play with your cat at home: by holding something at the end of a stick that they will want to pounce on. The enclosure has good vantage points from which you can see the big cats enjoying themselves. As for the danger level, these are definitely wild cats and I observed that a lot of work is done by staff and volunteers to ensure that visitors don’t do anything that would startle the cats or cause their natural instincts to kick in, causing harm. I suppose that also keeping them fed (boiled chicken) and happy do a lot to minimize some of the risks. While I was standing there filming from the wall (standing about where the man in the white shirt is taking a picture in the photo above), I suddenly sensed that there was something just over my right shoulder. Sure enough, the tiger cub (pictured with the monk several photos above) was walking along the top of the wall and had stopped because I was in his way. This picture, one of three that turned out very nice, wasn’t taken with any zoom lens! I was about two feet away from his whiskers. Beautiful animal but a bit unnerving to be caught unawares. I’ll leave you with this video compilation, about three minutes of footage of the tigers playing in the water. All in all, I think Gary and William had a fantastic time and I’d include a visit to the Tiger Temple on the itinerary for other guests. It is certainly an experience you won’t have at home. This entry was posted in Uncategorized and tagged Animal, Bridge, Kanchanaburi, Kwai, Monastery, Province, River, Temple, Thailand, Tiger, Tour, Tourism, travel, Wild by christao408. Bookmark the permalink. Heh… I know it doesn’t come close to acknowledging the power of a tiger / big cat, but my first thought upon seeing all of those beautiful photos? “Pretty kitty,” just like I say to my cat. Those are gorgeous animals. O… M… G…This is just too cute!!!!!!!!! Very lively blog! Definitely I will have an adrenaline rush there. I noticed that Gary and William were braver than I am. They dared to hold the tigers by the tail, mmm. Somehow, I am chicken and worry that this place might experience “accidental attacks” someday? 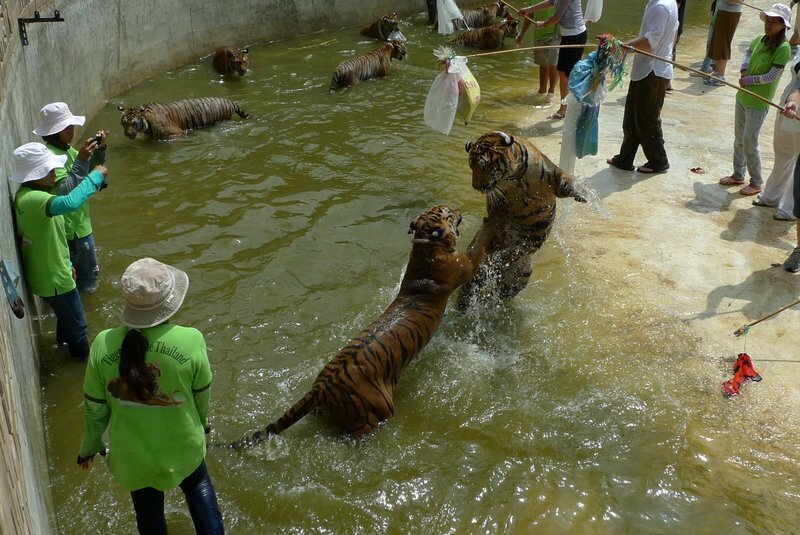 I have visited a Tiger place in NE China, but those tigers were in cages. This is quite an experience. wow. I would love to visit this place. Thanks for the great shots, story telling and the video! What beautiful animals — I particularly like the close-up at the end ! sooo cute! i want to goooo! how do we get there? oh, did you know that i am now in Bkk? do you have a restaurant in town? the big cats act like kittens….. look cute indeed! You got something going all the time. If its not traveling to Hawaii, its going to California. And then, there’s the 2.70 per head food challange and now this.. tigers galore. Beautiful animals! I would certainly enjoy visiting there. As child, maybe 9 or 10, I had the chance to pet a tiger who was in a zoo. I don’t remember where but I do remember my mum was against the idea. I did survive lol. As much as I like animals – I prefer to see tigers at a distance… but this was fascinating! I like the tigers from nature. These creatures were meant to be aggressive, and to see how soft man tamed them, kind of saddens me. Wow… I love cats and this would be a great experience. The close up pic of the cub is just too cute. It’s great to see pics of Gary and William! Maybe one day there will be a Xanga meetup in BKK?I just went to your 2006 entry. How odd… no comments? Did you get to play with the baby cubs? I thought that was the highlight of my trip. I love them! Another wonderful adventure with you two. This one is extraordinary! Saw the movie Bridge on River Kwai when I was 14 with my mother. Traumatic experience. 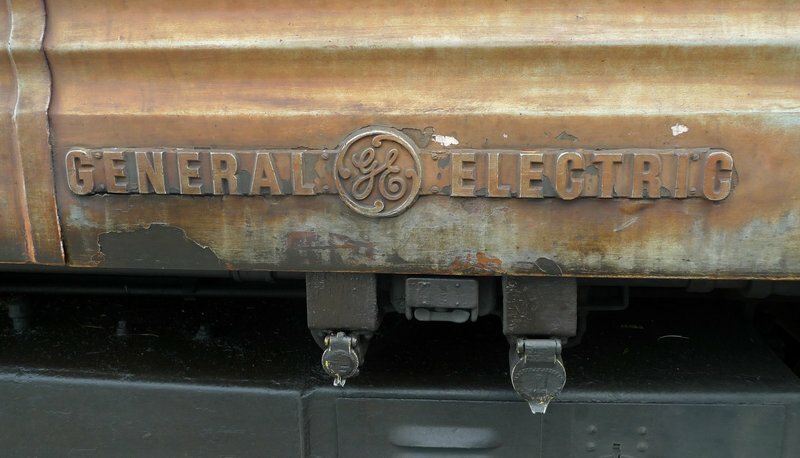 Love the old train and the GE sign on the diesel engine. As always, your photos are beautiful. Video was thrilling! @ElusiveWords – Sounds good for a meet up in BKK! Let’s do that. I had a really fun time feeding a bottle of milk to a tiger cub on my lap, it’s just like a kitty cat! It was a great outing and I’d love to do it again! Thank you for showing the wonderful sights and sceneries, Chris. I’m glad you had fun too! Splendid job taking all those wonderful photos and videos, especially the up close with the tiger cub! We should spend at least one more week in BKK next time. How about a Xanga meetup, as Matt has suggested, would be great! the tigers look AWESOME. i wanna bring one to bring home 🙂 how far is that place from bangkok anyways? 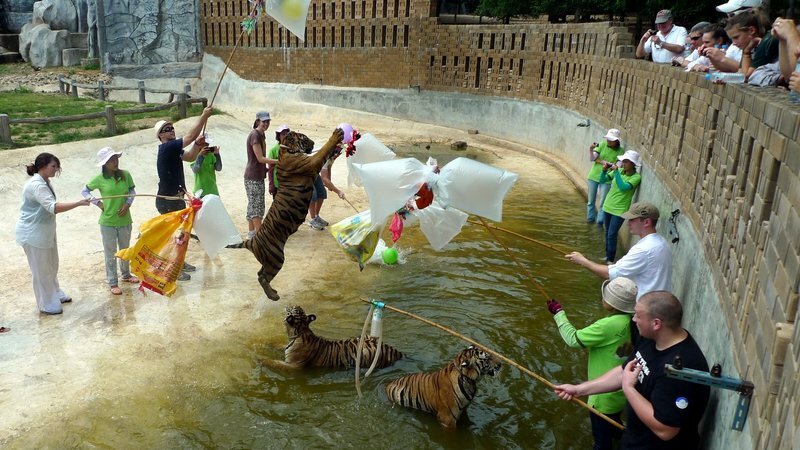 would love to visit the tiger temple the next time i go to bangkok. I enjoyed watching the video and Gary and William’s pictures. The monk smoking the cigarette was funny. I thought they renounced all wordly pleasure. Cute cub on the parapet, looked like it was scared to go into the water. Thanks Chris, this was beautiful. Cool. I love trains! They recently re-opened the express sleeper trains from the city to the southern part of the island of Luzon. I’m looking forward to try that out one of these days. 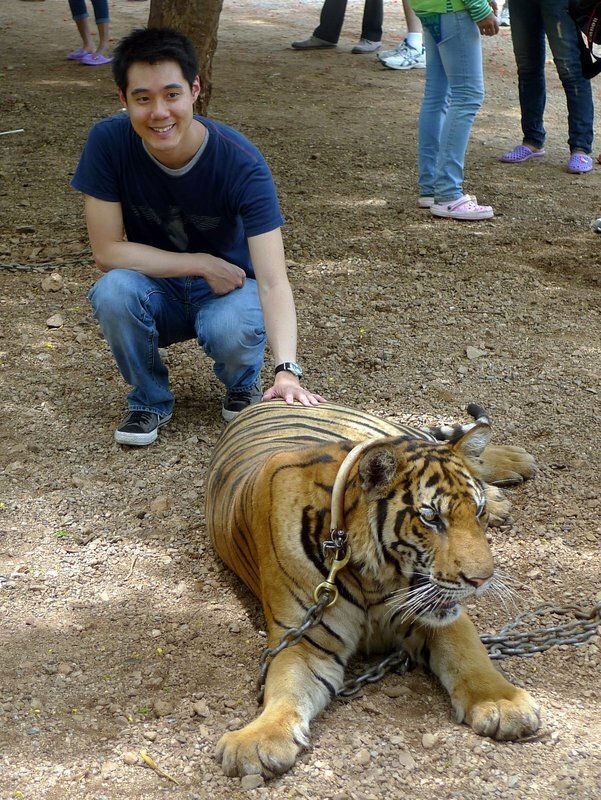 Anyway, playing with TIGERS! Is that safe? But so cool! 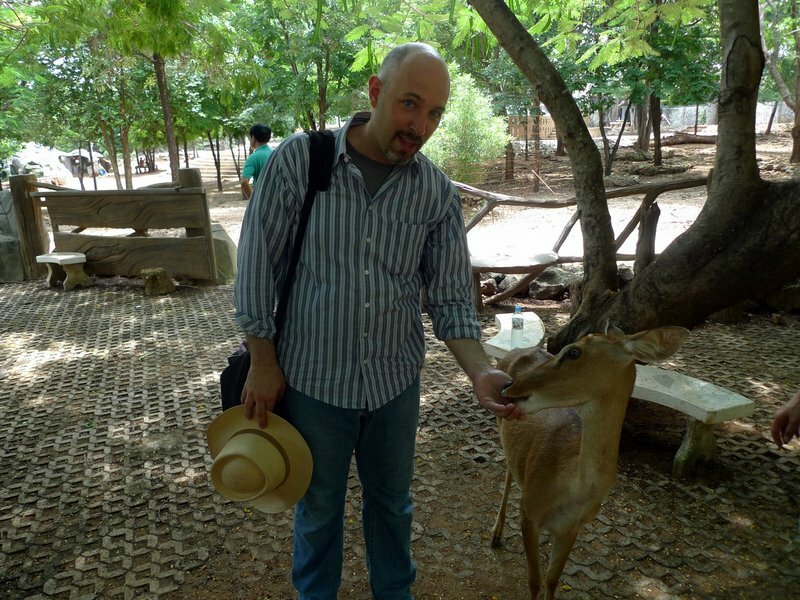 I would really love to travel to Thailand…next year perhaps! 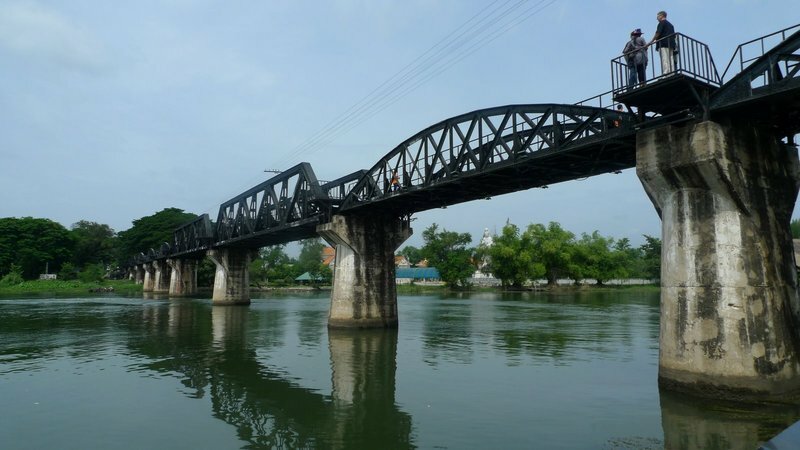 I went to Kanchanaburi ten years ago, saw the bridge, never rode the train though, visited the memorial museum and graveyard, stayed overnight by the river. 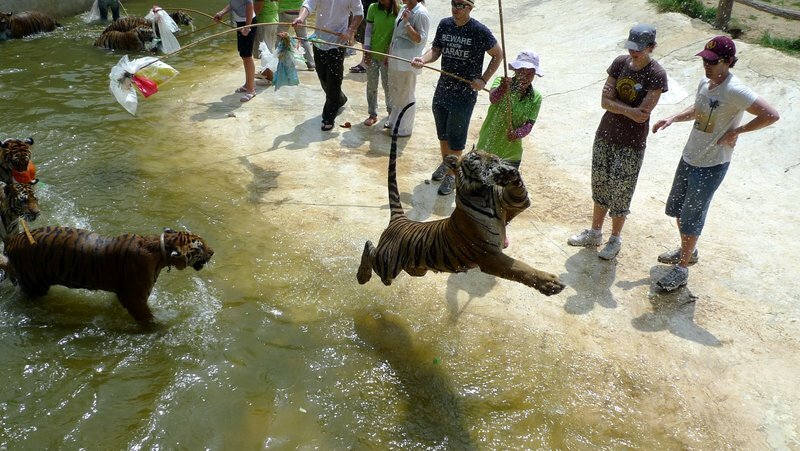 Never knew about the Tiger Temple but I hope to go see it in November. Thanks for that! Did not loose a hand or finger. @christao408 – Thanks! I guess that’s the thrill of it. I don’t know if I’m up for it though. i am studying here. r u running a restaurant here? i am gonna have hols soon so i’m still thinking where to head to. traveling by train sounds fun! @I_love_Burma – Nope, no restaurant! Just enjoy cooking. I’ve lived here almost six years now and work freelance in corporate training. For your holidays, have you considered heading north to Chiang Mai, Mae Hong Son, and Chiang Rai? Beautiful areas and should be nice this time of year. I can’t believe you can get so close to the Tigers! !